This is Leyna Gonzalez. When her mother was just 17 weeks pregnant, this ultrasound scan revealed that she had a tumour the size of a peach growing from her mouth. The only way to save her was to remove it while she was still in the womb—a procedure that had never been performed before. The tumor, a fetal oral teratoma, affects fewer than one in 100,000 pregnancies, reports the Guardian. Leyna's parents were told they could abort the pregnancy, or that they could wait for her to grow, until she was developed enough to be born. But the risks involved meant she would probably experience fatal bleeding upon delivery because of the tumor. They begged the doctors for another solution. 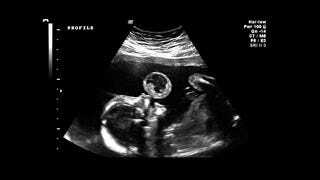 Dr Ruben Quintero, a pioneer in fetal medicine at the University of Miami, suggested that he could, perhaps, cut away the tumor while the baby was still in the womb. The parents leapt at the chance. The difficult procedure involved using an endoscope, guided by ultrasound, to reach Leyna through a minor incision in the mother's abdomen. Then, using a laser, Quintero cut away the mass in the baby's mouth. The surgeons announced the triumph yesterday, but actually the procedure took place two years ago. Five months after the operation, Leyna was born with no problems, other than a tiny scar on her mouth, weighing 8lbs 1oz. She's now 20 months old, and fighting fit.